2004: The Camden Redevelopment Agency approved a plan to preserve the building after a developer outlined a plan to create a restaurant-office complex at the building. The development firm, the Edward S. Brown Group, plans to spend between $700,000 to $900,000 to stabilize the building, followed by a renovation and a 31,000 square-foot addition. This project fell through for unknown reasons. 2008: The City of Camden sold the NJSDTC building, with a preservation easement to protect it in perpetuity, to a private developer with plans to rehabilitate the building into low-income housing. 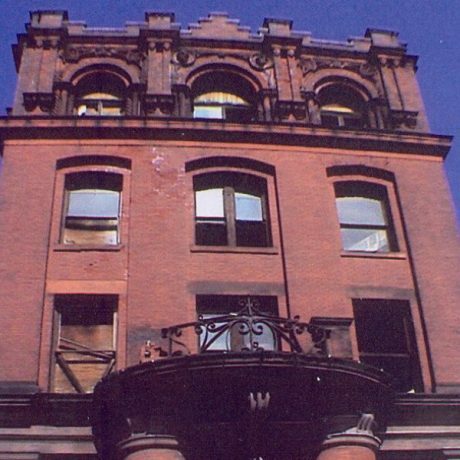 6/2010: The New Jersey Safe Deposit and Trust Company Building has been rehabilitated into low-income housing for seniors. With the help of funding and incentives from various Federal, state and local sources, including the Federal Historic Rehabilitation Tax Credit, the building is scheduled to open for occupancy in the coming months. The New Jersey Safe Deposit and Trust Company (NJSDTC) building is an exuberant, four-story Victorian office building. Designed in 1886 by Arthur Truscott, a Camden resident with a Philadelphia architectural practice, the building is made of brick with brownstone and terra cotta trim. It features a variety of bold design elements including a castellated roofline, stepped parapets, and rich ornamentation. The NJSDTC was the first bank of its kind created in New Jersey after the passage of legislation that authorized the establishment of safe deposit and trust companies. The presence in Camden of the first fruit of this legislation reflects Camden’s growing importance as a center of business and industry. The fate of NJSTDC generally mirrors the economic history of Camden but the building was still occupied in the 1980s. Today it is vacant, City owned, and threatened by the usual problems of vacant buildings: vandalism, fire, and, since the roof is damaged, water. Without remedial steps deterioration will accelerate. The City has an option for purchase by a developer who is interested in rehabilitation. But the option expires in June and, no action has been taken even to stabilize the building. We urge the City and the developer to redouble their efforts to preserve this building, which are both an architectural gem and an important marker in the history of Camden.